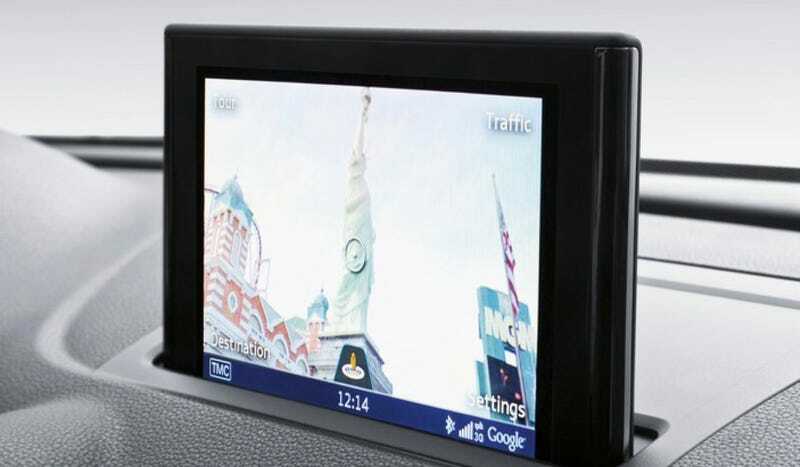 Navigation systems are great when they work, but they often don't take into account road closures, traffic jams and weird road conditions that can totally confuse you or, worse, cause a crash. Audi is apparently determined to fix that. The Germans are working with researchers from USC, UC San Diego, UC Berkeley and the University of Michigan to create an adaptive navigation system that will learn a driver's habits and create an adaptive route called Audi Urban Intelligent Assist. In the Urban Navigation system, drivers will get a notification on a smartphone telling them how long it should take get to get to their given destination before they even get in the car. They'll also be alerted about parking availability. Urban Assistance is what's going to stop people from crashing. Probably. Using the car's active driver aids, it knows when you can safely merge or change lanes in order to avoid missing your turn. If you do, it knows where to take you to safely turn around. Audi's team has been testing the system on the streets of San Francisco, which is a good place since nav systems are pretty easily confused by that city's roads. But have it come to Boston next and see if it develops any sort of road rage, or simply gives up and says, "The T isn't so bad."